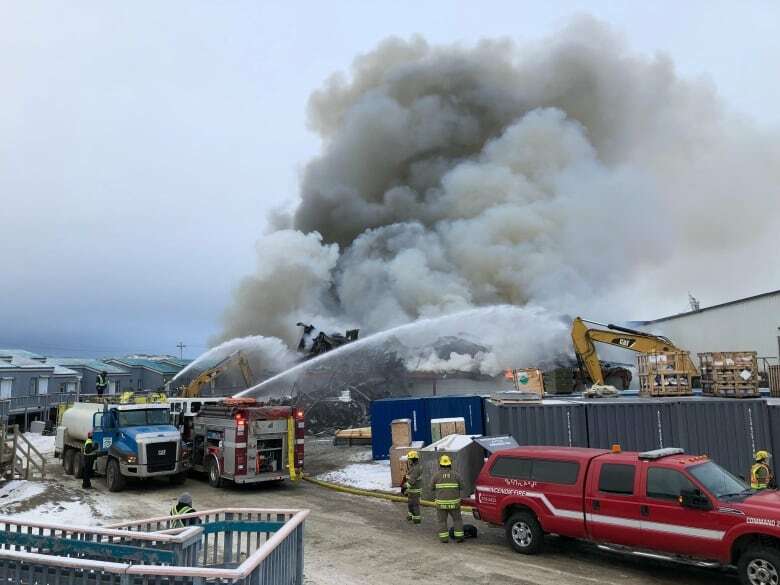 An early morning fire at the Northmart store in Iqaluit has forced the evacuation of nearby homes as crews work to put out the blaze and respond to other fires reported in the area. 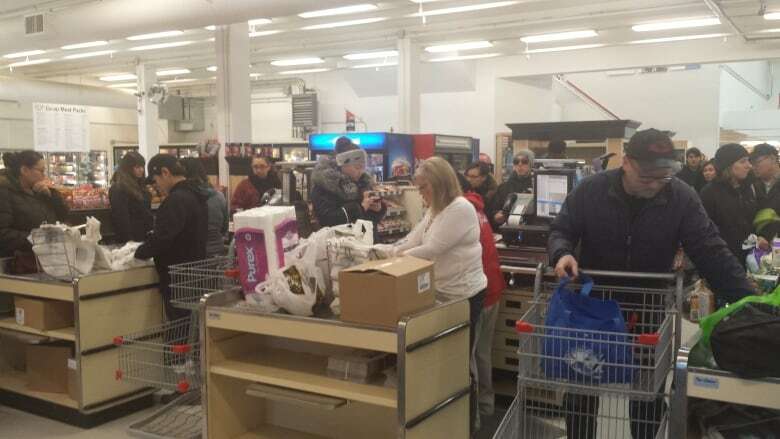 “We got a call at 2 a.m. that there was a fire in the store, and we came down and there was a big fire,” said Hassan Kassar, assistant manager of Northmart, one of two major retailers selling groceries and merchandise to people in Nunavut’s capital. “Unfortunately we are going to be closed today obviously with the situation we are in, until we are able to get into the building and assess what the situation is,” said Kassar. The fire is one of several blazes — also affecting debris beside the store and multiple vehicles — reported Wednesday night and early Thursday morning, all in the same area. RCMP, and municipal enforcement and firefighters are all attending to them. The city says 18 firefighters attended five fires, with three of them being car fires. The city’s acting fire chief Nelson Johnson said the fire started in the loading dock area and moved up to the attic. The part of the Northmart store that is on fire is the warehouse area, where the food that comes up on sealift cargo ships is stored. The city said there is enough space in the community to cover additional food storage needs. Iqaluit has no road connection to southern Canada, so all food must be flown or shipped into the city. The last of the sealifts before Frobisher Bay freezes just arrived, so losing food and storage space will have consequences for the city this winter. About half of the building appears to be destroyed. Two excavators worked to demolish the warehouse section to prevent the fire from spreading to the main grocery section of the store. Iqaluit Mayor Madeleine Redfern said it’s likely most of the non-perishables that have been shipped up are gone. “All the furniture, appliances, the snowmobile shop for the most part at this point has been lost. So it’s a major disruption for anyone who would need those goods over the course of the year,” she said. City Councillor Kyle Sheppard says it’s too early to speculate what impact the fire will have on food prices, but says he hopes the retailers will be “good corporate citizens” and minimize the cost consequences. The city is asking residents to conserve water Thursday so the water supply can go to fighting the fire. Water delivery to homes without piped water has also been cancelled for the day. Andrea Spitzer, the city’s communications manager, is asking residents to avoid the area around the store to allow emergency services to work quickly. Nakasuk Elementary School, across from the Northmart, will remain closed for the day. The fire forced the evacuation of a set of townhouses for community elders behind the store. The elders living there have been temporarily relocated to the Elders Qammaq — a community gathering place and drop-in centre for seniors. The Canadian Red Cross is also assisting the elders. The government of Nunavut is working on finding longer-term accommodations for the displaced elders. The fire is causing long lines at the city’s smaller grocery store, Arctic Ventures. “There’s a little bit of panic, I guess, considering we’re the only main grocery store left in town, so people are concerned food is going to run out,” said John Simms, director of subsidiaries and auxiliary business for Arctic Cooperatives, who is responsible for the Iqaluit store’s operations. He said he’s confident in the store’s ability to provide enough food for the community. Arctic Ventures is able to triple its food shipments, which come in on a cargo flight once a week, bringing in an extra 27,000 kilograms weekly without changing its shipment schedule. “There will be food flown into the community on a regular basis, if not more frequently at this point in time,” the mayor said. Northmart had a food shipment scheduled to come in Thursday, and Arctic Co-operatives, which owns Ventures, said it will take the food as part of a contingency plan to feed Iqaluit. Iqaluit has four convenience stores and two specialty stores that also sell food.